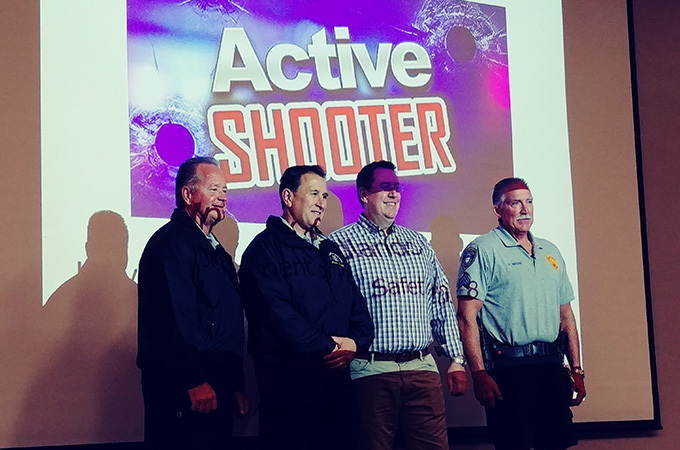 U of R Sergeant Tony Gorrell, U of R Assistant Chief Andrew Flores, retired Redlands Police Department Sergeant Andy Capps, and U of R Sergeant David Waters (left to right) get ready to provide safety training to U of R students. If you were confronted by an active shooter on campus, in a stadium, or at the shopping mall, would you know what to do? A presentation at the University of Redlands this week helped students and other members of the community have a better sense of their options. Andy Capps, a retired sergeant in the Redlands police force, took part in the discussion that was sponsored by U of R’s Public Safety Department and sorority Alpha Theta Phi. Capps was among the first responders for the December 2, 2015, terrorist attack at the Inland Regional Center, where 14 people were killed and 21 injured at a holiday party. That normal day was turned upside down, Capps said, when he was flagged down by plainclothes detective Nicholas Koahou. Koahou had identified the terror suspects fleeing the grizzly scene in a black SUV. The resulting chase and shootout ultimately involved more than 100 officers and 400 rounds of shots fired. It resulted in the death of the two perpetrators and put a conclusive end to a rampage that could have led to further casualties. Since the attack, Capps, who has been called a hero for his response, has met with many of the incident’s survivors, as well as family members of those lost. He noted he has heard “a lot of regret” from survivors about what they could have done differently. Have a plan. Gorrell encouraged audience members to make it a habit to note the nearest exits. Capps added that, as a police officer, he had visualized his strategy (in his case, putting the most car possible between him and the shooter) in a shootout, a step he found invaluable when confronted with the real thing. “Planning ahead pays dividends,” Capps said, noting that it often takes only 10 to 15 seconds to think about how you might respond. Evaluate your options. Don’t fall victim to a herd mentality. Think through your best option—which boils down to a choice to run, hide, or fight—and the best way to achieve it. This may involve running to a different exit than others; locking and barricading yourself in a room, turning off the lights, and silencing your phone; or, as a last resort if life is in danger, attempting to disrupt and incapacitate an attacker. Don’t give up. “Tell yourself you are going to survive and help others as needed,” said Gorrell. It is likely emergency responders are on their way. Stop the bleed. “Many lives are lost through uncontrolled bleeding,” Gorrell noted, saying that police training has changed over the past few years to address this finding. If you are safe and in a position to help others, applying a tourniquet or direct pressure to stem copious bleeding can save a life. As the conversation ended, Public Safety Officer Jorge Valles thanked members of the audience for coming, especially as such topics are often difficult to discuss. “You’re leaving smarter than when you came in,” he said. To contact U of R Public Safety, which provides a range of safety training upon request, email public_safety@redlands.edu or call the department’s 24-hour emergency and business phone number, (909) 748-8888 (ext. 8888 from any campus phone). For more information on emergency preparedness at the U of R, see the Emergency Preparedness web page.